If it ain’t broke, don’t fix it. That’s what’s happening here with Yamaha’s FZ-07, the winner of our Best Value award for the third straight year (2014, 2015). The 07 continues to impress due to the simple combination of its punchy 689cc, 270-degree parallel-Twin, sub 400-pound wet weight (397 lbs), and $6,990 price tag – the same it’s been since 2014. It makes a great companion for the everyday commute and is a joy to play with in the canyons. It’ll start to protest when the going gets super aggressive, but that’s not unexpected from a $7000 motorcycle. The competition has started to catch up with Yamaha, with KTM offering up its 690 Duke, which makes exactly the same power as the FZ (69.8 hp) from its 690cc Single, weighs 50 lbs less, and is better suspended. However, it’s $8,999 price tag is a whopping two grand more than the Yamaha. In a category like this one where value is king, the KTM simply isn’t $2000 better than the FZ. 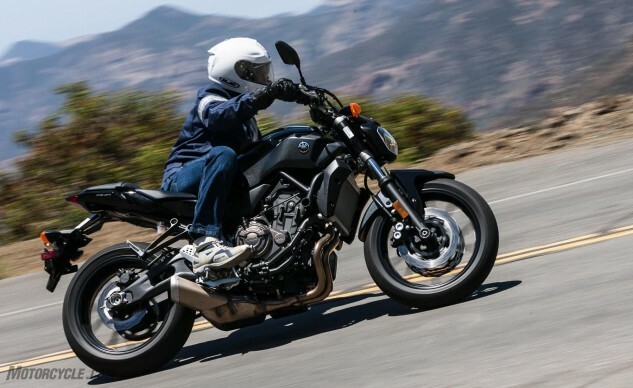 Suzuki’s revamp of its SV650 to compete on both price ($6,999) and performance is the closest threat to the FZ-07’s dominance, but though the SV’s venerable 645cc V-Twin is as lovely as ever and makes one more horse than the Yamaha, the Suzuki’s porky 430-lb curb weight was its ultimate downfall when we placed the two Japanese competitors and the Austrian against each other earlier this year. So it’s not like Yamaha is simply cruising to an easy victory in the value category year after year – the FZ-07 really is a fantastic motorcycle at a spectacular price. The same qualities that make the Indian Scout Sixty the Best Cruiser of 2016 make it an incredible value. Indian created a motorcycle that costs 20% less than its bigger sibling and gave it 95% of the torque and 83% of the horsepower. Next came the same brakes and suspension as the larger bike that, by-the-way, won Best Cruiser and Motorcycle of the Year in 2015. Now, make everything else the same, save for a few dress-up details, and sell it for $8,999. 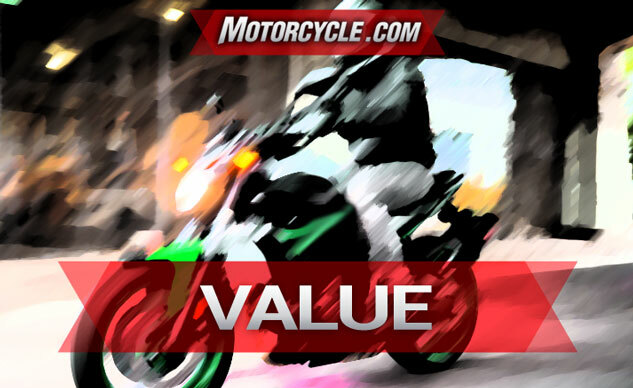 This is the prescription for a great value – since the motorcycle it is based on had already struck an amazing balance between premium features and reasonable price. To put the Scout Sixty’s accomplishments into perspective, one needs to look no further than our Great American $9k Cruise-Off, which pit the Sixty against the Harley-Davidson Iron 883. The Sportster has long been the go-to model for cruiser fans looking for an American-made cruiser in $9,000 price range, but when the dust settled, the Sixty ended up on top by almost two percentage points, largely due to the strengths of its engine, suspension, and build quality. On the import side, in their most recent shootout the Vulcan 900 Classic LT (the same engine as the non-touring $7,999 Vulcan 900 Classic) cranked out a mere 42.7 hp and 50.9 lb-ft., while the V Star 950 Tourer ($8,690 for the base V Star 950) churned out slightly more with 47.3 and 54.5, respectively. 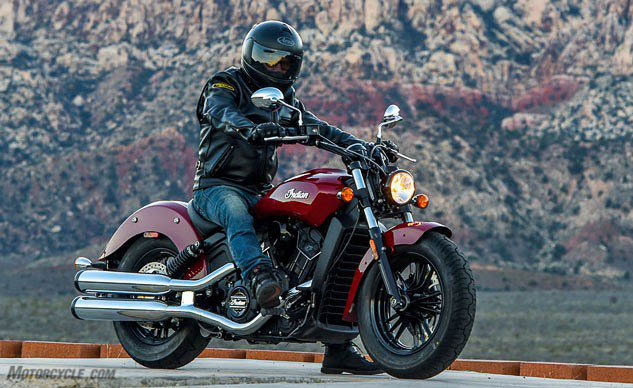 Compare that with the Scout Sixty’s 69.0 hp and 59.4 lb-ft of torque, and the bang-for-the-buck value shines through. So, while the Indian Scout Sixty couldn’t best the Yamaha FZ-07, it places a solid second in the Best Value MOBO category. Get price quotes for Indian from local motorcycle dealers.